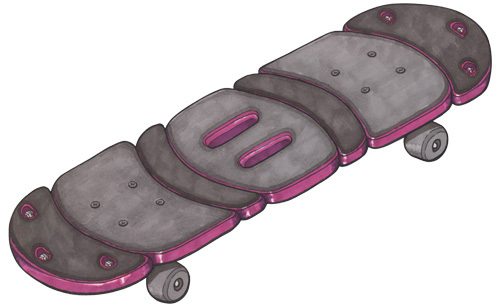 3D Printing goes "Old School"
What we have here is a modular skateboard. Letâ€™s call it the â€œModUSk8 V1.0â€� to give it a short and shite name. The ModUSk8 started life as a personal project. Having lots of M8 threaded rod left over from a RepRap build, I was looking for a useful way in which to reuse them. At the same time my daughter was after a new skateboardâ€¦ The stars had aligned! "Why not create a *full-size 3D printed skateboard deck using the M8 rods for structural integrity?" "Why not make it a modular design so you can add or remove or change components in order to change the length of the board?" In its current configuration, the ModUSk8 deck measures 71.5 cm x 19 cm. This equates to a mid-size board ideal for children (although the skateboard has been tested up to a maximum weight of 70 kg). 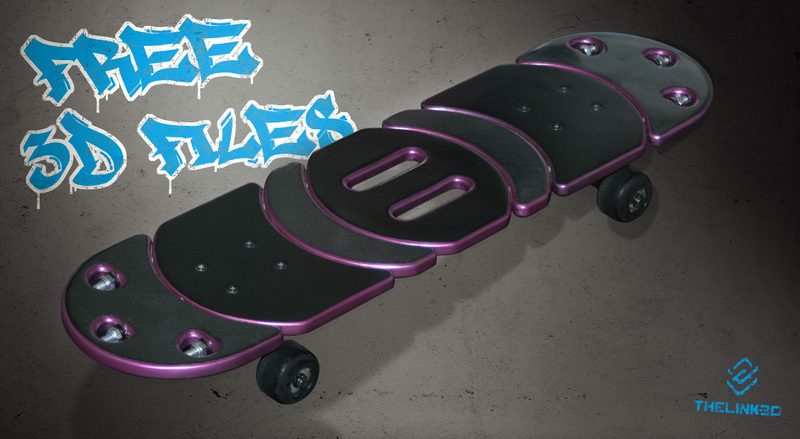 Download the 3D printable skateboard files here. The files are free for personal, non-commercial use. 3D print the files in ABS. For reference, my parts were printed using a rectilinear (cross hatch) infill of 40%. The design uses standard truck hole spacings of 2.125â€� x 1.625â€� for the truck mount piece. If you have different trucks, just mod the holes in the .stl file. 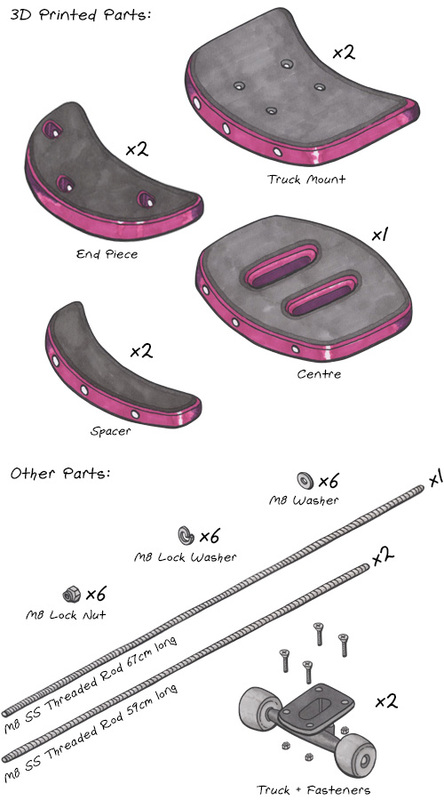 Assembly is straight forward, but just in case Iâ€™ve drawn up some basic instructions below. If you liked this, follow us on twitter @newskindesign and @thelink3Ddotcom for more news and freebies! Line up the parts as shown. Start by threading the longest (67cm) rod through the centre holes of the parts. 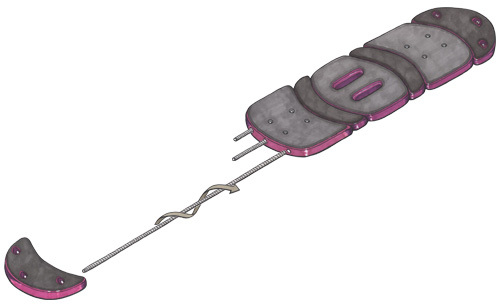 Use a drill to slowly rotate and insert the rod, taking care not to damage the threads on the rod. Having someone else to keep all the parts flat and aligned while the rod is being inserted is very helpful. Repeat for the outer 2 rods. File out the holes of the remaining end piece so it can slide onto the rods. Add a plain washer, then a lock washer and finally a lock nut to the end of each rod. Tighten. The deck is now complete. Fasten the 2 trucks to the deck with the screws and you have a finished, working 3D printed skateboard! It would be great to see photos of your boards. Feel free to mod it.